What shape is this? Is it a 4615? I've recently picked up a few more vitrified saucers, including a couple of RNZAF ones. I now have three 4619-shaped hotel cup saucers but the fourth saucer is different. It is the exact same dimensions at a 4619 but has a different foot ring, similar to the 702 saucer used under the 700-shaped railway cups. The backstop suggests this saucer was manufactured in 1967 where-as the other saucer is mid-70's (as are the other two blue-rimmed 4619's I have from the airforce). I've also had a look at this post (vitrified cup and saucer guide) but the saucer showing there as a possible 4615 has a different foot ring again, hence my confusion. Re: What shape is this? Is it a 4615? I'm pretty sure of the saucers I have pegged for 4610, 4615, and 4619, so this is tricky. The dates of first use could be helpful but the only one we have is the 4619 and the year is 1969 so your saucer cannot be a 4619. 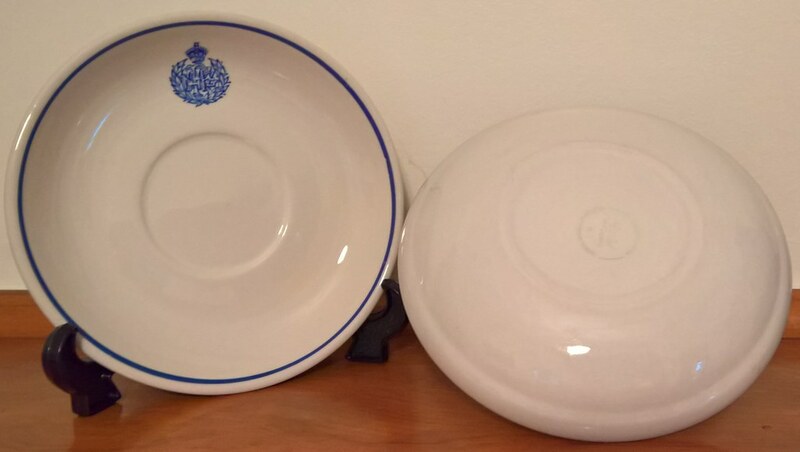 That pattern of saucer (same footring), in different sizes, was used for demitasses (774, small obviously) and hotel/railway saucers (large, 702) but there may have been a size between, which would have had a three digit number, that has not appeared yet. 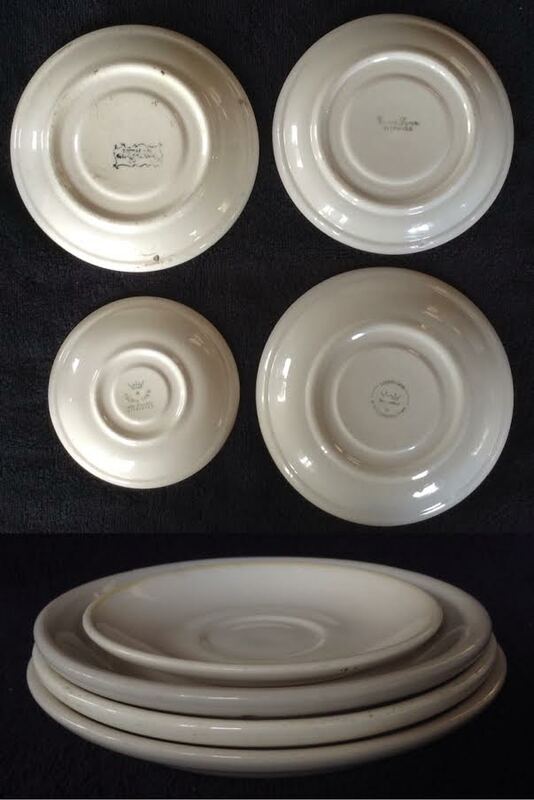 I am pretty sure I have seen some earlier vitrified saucers for which no number has been found but unfortunately I don't win every trademe auction so I don't always get the hands on experience, chance to measure and so on. I don't think I have any like yours but I will check Jim's collection as he always turns up the odd ones. If your shape is a 4615 then that would mean another number is required for the cafe saucer that accompanies the shallow tulip, 3616 and 3619. That saucer has appeared in sufficient numbers for it to be considered as one of the significant shape numbers. I don't think there is a four digit number going spare. Ev will be able to provide documentation for numbers for saucer to match 3616/3619. The fact that the measurements of your saucer match those of the 4619 is indeed reason to consider it as 4615 as the description for one says it replaces the other. Alternatively the short period of production for the saucer I have pegged as 4615 also makes sense of that description. Crown Lynn was constantly tweaking shapes so maybe your saucer was a forerunner to both 4615 and 4619. A good example of such tweaking is the demitasse saucer 774 which started out as same mould for earthenware and vitrified then about 1960 separate moulds were made for e/w (a simple coupe) and vit (roll edge added), but there was also an intermediate shape for the earthenware 774s which disappeared very quickly. One question. You said the measurements match 4619: does that include the cup well? Note: I originally place "774" in the wrong parentheses where it would not have made sense. Corrected now. Note also: the modified vit 774 became the 734, which number previously was used for a jug. I've measured the well of both saucers and they match in width. The depth of the well on saucer 'x' is shallower than the three RNZAF 4619's I have by about 1/2 a millimetre. I hadn't considered the possibility of a 3 digit number - when I first saw it I mistook it for a 702 until I 'clicked' that it was the wrong size. I think it must be a three digit, and there are others! When I saw this trademe listing I thought ahah, this cup, like a smaller 700 with a Carlton cup (755) handle, also fits the 702 saucer. Although I first identified my Refreshment room saucer as being earthenware Ev corrected that. I think I said Jim's extra large one was earthenware but I could be wrong there too. The standard 702 is about 156 diameter, these other two are 160 and 150. The latter has an NZG 48-55 backstamp. We have no numbers for them either. Neil from Timaru (funho60 on tm) has replied to my question to say that his "Chalmers" saucer is 145mm in diameter. My measurements for "my" 4615 and 4619 come in at 140 and 142 respectively. Measurements of individual items with the same shape (... number) may vary from batch to batch and I have noticed some wild variations over time, so I am inclined to think that the auction saucer and Bruno's saucer are the same shape number and that because the auction saucer has a "crown and star" backstamp (1955-64)* I am inclined to think it should have a three digit number, likely one of the missing early 700s (701, 703-5), along with the auction cup (which remember is like a 700 but different). 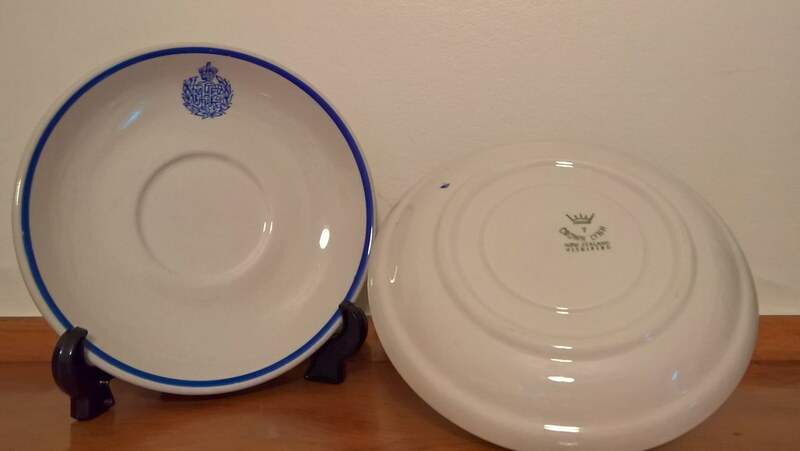 *Dating for the "crown and star" backstamp is usually taken as 1955-1965 but because year numbers on vitrified wares (other than Gibsons and Paterson) appear to commence at 5 for 1965 I have whittled one year off. Bruno, supposing the RNZAF saucer is the same shape (... number) as the Chalmers saucer the next thing to consider is the cup shape that goes with it. I think that your 4619s would have had either 755s or 3610s, but I think either unlikely for your unidentified 70x saucer, as their matching saucers are documented, therefore I'm wondering if the unidentified 70x cup is the one. But I do not recall ever seeing such a cup with RNZAF monogram. I grabbed a photo long ago of one NZR cup (red-brown "O" NZR monogram), without saucer, that appears to be that shape (and Crown Lynn) and which I think from memory was later (60s or 70s) rather than earlier (40s or 50s), but I cannot be absolutely sure that the shape was made as late as 1967 without more digging. My three battery cups in the same shape all have crown and star stamps indicating 1964 or earlier. I only remember one of the battery brands, Erg, still existing when I worked for my uncle "Battery Man" in New Lynn in the late 1970s. I think I must buy now on the Chalmers duo, as my only matched pair in those shapes, at risk of paying too much (as seller has already sold one duo and may have more). The early NZR saucers were only 145 across! So, the latest instalment in this saga is one that gives me great joy. 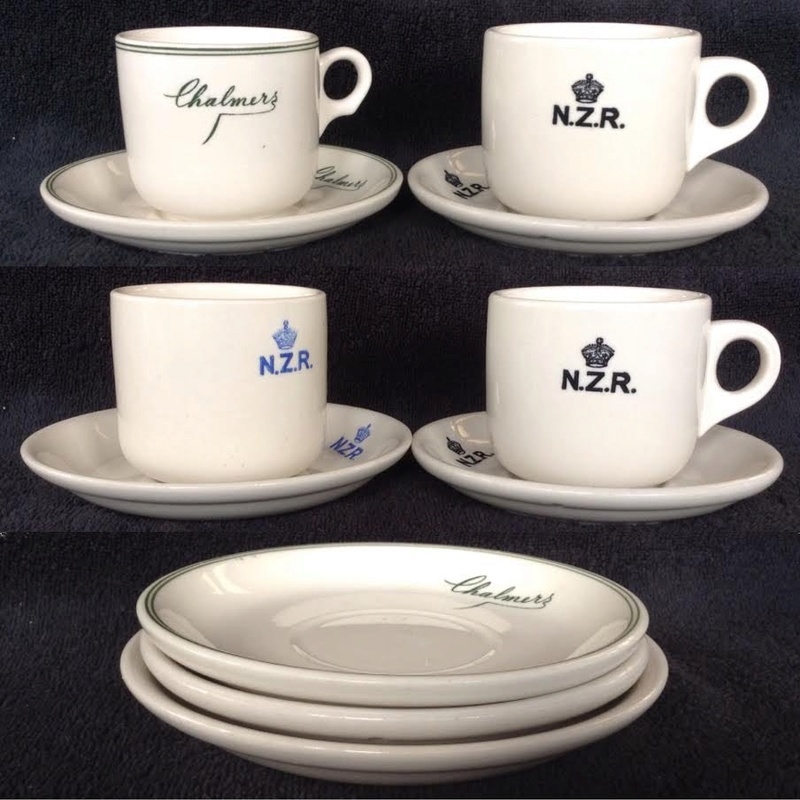 Last week I spent a massive $58.50 on a black monogram NZR saucer to match my 48-55 black monogram NZR cup. I caused myself some unnecessary grief over the weekend as I believe Crown Lynn revived the black monogram cup in later years and I feared I may have inadvertently paid hugely for a horrid 4619 saucer. Relief: the saucer has the correct 1948-1955 backstamp. Delight: just as the 48-55 black NZR cup is slightly smaller than the 55-64/65 blue monogram version, so too is the saucer ... by 10mm! No photos just for now sorry but this early CL saucer is the same size as Bruno's mystery saucer, and, from what I have been told by Neil funho60, also the same size as that from my "Chalmers" duo, which has the smaller cup with Carlton handle. Are the 145mm 48-55 saucer and the 155mm 55-65 saucer both 702s? Are all the railway-type cups with the same handle (in three different sizes even before enlargement in the 1960s) all 700s? And what number is that railway-type cup with the Carlton cup handle? I was all prepared to tentatively dub the 145mm saucer a "703", (quotes included) and the Carlton-handle cup a "701", but need to pause again for more thought. If I can get the boy to take photos for me I will post shortly otherwise I wait for my next arrival. I have located my black NZR cup so have paired up the duo to photograph. Same backstamps, so a matched pair. Last but tastiest is that I just noticed my RNZAF 702 has the 48-55 backstamp, and is the larger size, so two sizes of saucer both made in the 1948-55 period AND both made in the post-1965 era. They must surely be two different numbers !!! I changed the picture above as my Chalmers duo arrived. The Chalmers saucer is the same size as the black NZR one. The blue NZR is bigger. Note: the handle of the blue badged cup is concealed at the left, as it opposes the transfer. 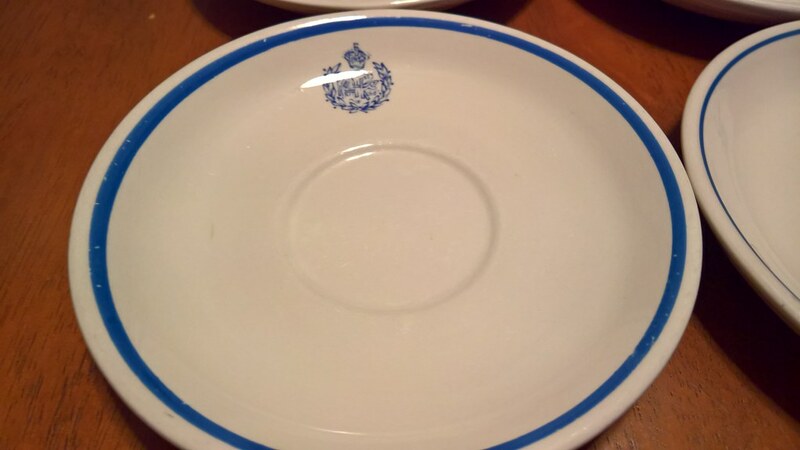 The same plate shape in four different sizes. When I photograph Jim's odd one there will be five. 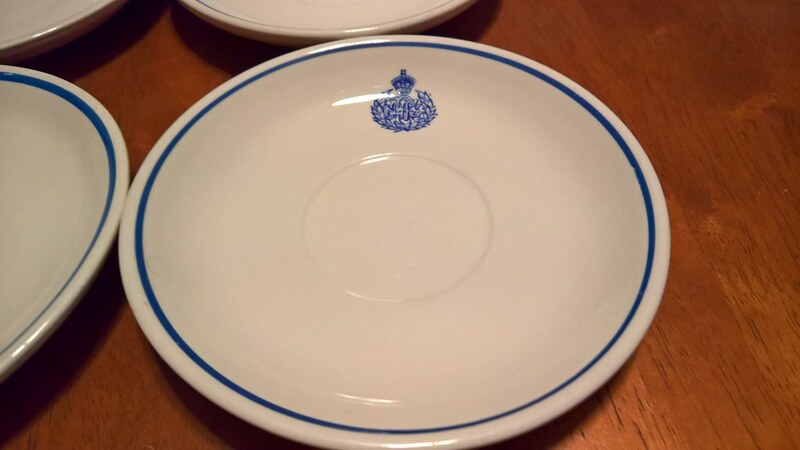 I believe Crown Lynn took the original shape from a Maddock saucer. I've taken some replacement pics showing five saucers but have yet to post them. Latest news on this subject is that there is currently listed on trademe a black NZR monogram saucer with 55-64 backstamp that measures 155. So it appears to be not about colour but about age. 48-55 is 145, and 55-64 is 155. That was really dumb luck mine turning out to be the right one for my cup. I didn't ask the size or the mark or ask for a photo of the base. This would have done but I do like to get so proper match. It's nowhere near the price I paid yet, but early days.